PineNutOil.org presents recent clinical study about pine nut flakes which are an organic health solution for general health improvement. Dr. Maria Kazakova proves that, protein-vitamin product “Pine Power”, under the brand Siberian Pine Nut Oil is an organic health solution as it consists of compounds that strengthen the immunity and improves general health of children and adults. PineNutOil.org has released clinical study which had been conducted on November 15, 2012, demonstrating that building immune system’s resistance to the detrimental environmental factors that pose the risk of developing various diseases in children and adults strongly correlates with the provision of an organism with the full and balanced complex of all the essential nutritional elements found in organic Siberian Pine Nut Flakes, hence being an optimal organic health solution. The specialists found that in recent years there has been a constant rise in the rate of diseases involving neuroendocrine, immune and allergic disorders, anemia, and diseases of the circulatory organs, which substantially affect adolescent’s and children’s health. It was observed throughout the research that children’s health in psychological area is becoming worse, mainly at the expense of borderline psychological disorders. This is evident by a constant increase in the number of handicapped children. PineNutOil.org, together with the scientists of the Clinical and Experimental Lymphology Scientific Research Institute of the Siberian Division of the Russian Academy of Medical Sciences, present to the world natural protein-vitamin products produced from wild harvested, organic grade Siberian pine nuts as an organic health solution for children’s and adults’ immune system and general health enhancement. On the other hand Ph. D. V. V. Budaeva confirms that Siberian Pine Nut Oil is an organic health solution for the treatment of arterial hypertension in persons with accompanying obesity, hyperlipidemia and hypercholesterolemia with the goal of correcting risk factors and the prevention of cardiovascular complications. 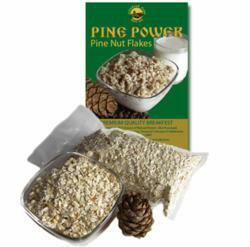 At the same time the regular use of “Pine Power” – pine nut flakes - makes it possible to effectively compensate for a deficit of protein, vitamins, and mineral substances in a natural form, and assists in the strengthening of immunity. The scientific evidence points out that the dietary fiber in the product has the ability to bind toxins and metabolic products in the intestines and to remove them from the body. “It is a culture medium for the normal micro flora of the intestines; therefore, Siberian Pine Nut Flakes contribute to the prevention of dysbacteriosis and improve general health.” – notes Dr. Maria Kazakova. According to Dr. Maria Kazakova pine nuts contain significant quantity of fat-soluble (A, E, D, K) and water-soluble (B group, C, PP) vitamins. This product is successfully used for the preventive treatment and correction of hypovitaminosis. The mineral composition of the Pine Power is noted for its high content of potassium, magnesium, phosphorus, copper, zinc, and iodine. Saturating the body with biological forms of iodine which are greatly present in products from PineNutOil.org improves the function of the thyroid gland. In addition, Dr Maria Kazakova draws that the pine nut flakes may be an organic health solution for the preventive treatment and correction of conditions involving children’s health issues such as: iodine deficiency, which are prevalent in children and will often appear in the form of a delay in physical and mental development. Dr Maria Kazakova highlight that Pine Power, under the brand name Siberian Pine Nut Oil is a source of all the protein essential for the growth, development and for strengthening the immunity of the child, therefore boosting children’s overall health. The plant protein of the pine nut kernel contains all the necessary amino acids and is excellently assimilated. Dr. Maria Kazakova states that the Siberian Pine Nut Oil extracted from the pine nuts contains an optimal ratio, for children’s health, of polyunsaturated ,Omega-3 and Omega-6 essential fatty acids, which are important for the formation of new cells during the intensive growth period of children. Moreover, the regular use of pine products from PineNutOil.org improves the formation, growth, and development of all the organs and systems of a child’s body, and restores the mechanisms of self-regulation that have been genetically established, hence directly contributing to the children’s health state of body and mind. Conclusively the study conducted by the head of research department Dr. Maria Kazakova proves that, protein-vitamin product “Pine Power”, under the brand Siberian Pine Nut Oil is an organic health solution as it consists of compounds that strengthen the immunity and improves general health of children and adults. Dr. Maria Kazakova, Clinical and Experimental Lymphology Scientific Research Institute of the Siberian Division of the Russian Academy of Medical Sciences.